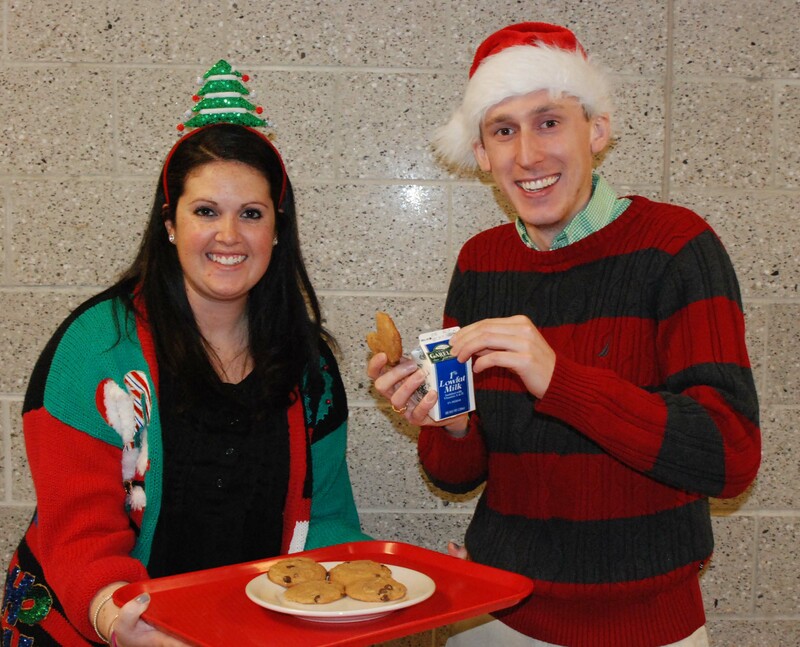 Every year, The Veritas staff names two teachers with high spirits and joyful cheer Mr. and Mrs. Claus. Hard thought and voting went into this decision, and the staff decided that French teacher, Mr. Finn and Special Education teacher, Ms. White are a great fit. These holiday spirited teachers answered a few questions for us about Christmas. Q: How do you feel about being selected? A: I couldn’t be prouder. I’m flattered, honored and very excited to represent Mrs. Claus at RHS! A: I love them all! But I’d have to say White Christmas or The Santa Clause… I haven’t seen a Christmas movie I haven’t liked. Q: What’s your favorite Christmas song? A: “Have Yourself a Merry Little Christmas”; it brings tears to my eyes every time. Q: What was your favorite gift as a child? A: A Barbie computer disc; it allowed me to print my own clothes. Q: Favorite winter outdoor activities? A: Always going up to the mountains and cutting down our Christmas tree. Q: What’s your wish for students at RHS? A: For everyone to have a happy and healthy holiday and to pass all their classes/graduate. Q: Is Christmas your favorite holiday? A: Yes, hands down; I wait all year! Q: Do you go Black Friday Shopping? A: No, but I did Cyber-Monday. Q: To you, what’s Christmas really about? Q: First sign that Christmas is approaching? A: When Halloween ends, my favorite season is coming. Q: What’s your favorite holiday treat? Q: Do you prefer giving or getting presents? A: Giving, if I know they’ll love it. Q: What do you say to people who say they aren’t sure Santa even exists? A: What, there’s no Santa? A: I feel pretty awesome; I’m honored and it feels nice. A: The original Home Alone; I don’t even have to think about it. A: Super Nintendo because Super Mario World is my favorite game ever. A: Throwing snowballs or running; I have metal spikes on my shoes. A: Baking Christmas cookies with my mom. Q: What’s your wish for the students at RHS? A: To start 2016 off on the right foot and to enjoy themselves and have a good break. A: No, my favorite Holiday is by far Thanksgiving. It has nothing to do with presents and everything to do with being with family. A: God no, but I did Cyber-Monday. I don’t have to leave my house and deal with the crowds and fights. Better deals come after Christmas anyways. A: Making other people happy. A: When I allow Christmas music to be played in my house after Thanksgiving. If I hear it before Thanksgiving I turn it off, one holiday at a time. A: Giving; I get more out of giving than I do getting anything.